Pictured at the launch are Bill Crymble (left), director of Forever Living Products Ireland, Jingle All The Way campaign sponsor; John Madden (back third from left), principal of Roddensvale School, who compered the morning event; Cllr Maureen Morrow (back, third from right) and members of the Larne NI Hospice Support Group. The Mayor, Cllr Lindsay Millar, who hosted the launch, is seated with Mrs Joan Christie CVO, OBE and Alison McClean, Events & Marketing manager, Forever Living Products. Larne organisations have pledged to ‘Jingle All The Way’ this Christmas in support of Northern Ireland Children’s Hospice. Roddensvale School choir inspired guests as they sang a selection of festive favourites during the launch of the charity appeal at Larne Town Hall. Special guest, Her Majesty’s Lord Lieutenant for Co. Antrim Mrs Joan Christie CVO, OBE urged everyone in the town to get involved. Mrs Christie praised the unique work of the Children’s Hospice with special appreciation to all the volunteers who make such a difference to the lives of these families. 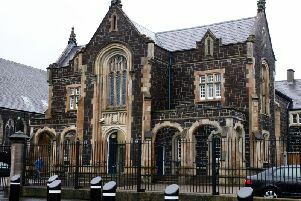 The Mayor of Mid and East Antrim, Cllr Lindsay Millar, who hosted the launch, said: “This is a brilliant concept and one both I and the entire community can get behind. Jennifer Beattie, chairperson of Larne NI Hospice Support Group, said: “Jingle is now in its second year in Larne and we are so proud of what we have achieved to date. Last year the community, in all sorts of different ways Jingled all the way to raise over £32,000. You can join Larne’s Big Jingle Parade on December 7 or host your own little Jingle. For further details, contact Deborah Neill: email deborah@larnecdp.org or call 028 2826 7976. Or Roma Brown: email roma.brown@hotmail.co.uk or call 07799 442347.